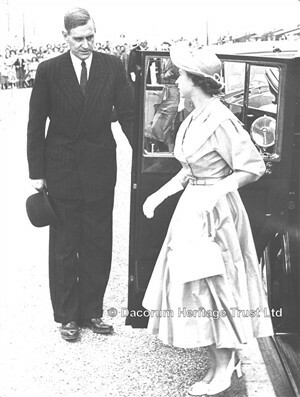 The Queen’s visit to Hemel Hempstead in 1952 | The Dacorum Heritage Trust Ltd. When it was announced that Hemel Hempstead was to become one of the new ‘satellite’ towns for London, there were many misgivings locally. The plan devised by Professor Abercrombie and enlarged upon by Geoffrey Jellicoe for the Hemel Hempstead Development Corporation provided a series of housing areas distributed around the town, with each area having its own facilities for schools, shopping, leisure and churches. Initially the plan was to provide new housing accommodation for people from the London Boroughs of Acton, Wembley, Willesden and Harrow. Adeyfield, as the first new area to be developed, was where the first four families, (one chosen from each of those Boroughs) were to be re-housed. Adeyfield was close to the designated new industrial area and was centred around a shopping area called ‘The Square’. Additionally there was a community centre and a public house, named the ‘New Venture’ to signify the fresh start for the incoming families. 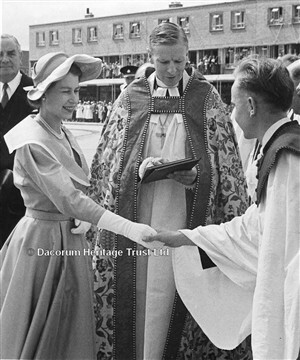 Building the first new church for this community brought an opportunity to invite Princess Elizabeth to Hemel Hempstead to lay its foundation stone. Sadly, the death of King George VI in February 1952 caused all her plans to be cancelled. Then, in April, it was announced that the Queen would indeed make her planned visit on Saturday 19 July but this was subsequently changed to Sunday 20July to coincide with a visit to St Albans Abbey. The Queen visited Adeyfield on 20 July 1952 to lay the foundation stone for the new church of St Barnabas. This was a particularly poignant occasion, as King George VI had died only five months previously. The Queen, as head of the Church of England, was to perform a very significant act in relation to her church, but there were a number of underlying ceremonial factors, which had to take place. First, the Queen had to be met by the County’s Lord Lieutenant, then the High Sheriff, before the civic dignitaries of Mayor and Town Clerk of Hemel Hempstead. The Mayor next introduced the Bishop of St Albans so that the stone laying service could take place. 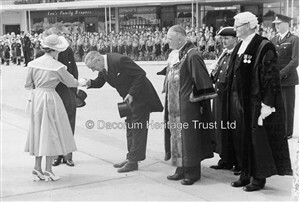 Herbert Christopher, the Mayor and Bailiff, also introduced the Queen to the Chairman of the Hemel Hempstead Development Corporation, who then accompanied the Queen on her tour of the New Town.